ஜில்லா ஜில்லா ஜில்லா இவன் எங்கும் செல்வான் தில்லா….This is the humming and the theme music that you can hear throughout the movie. The movie is around the son and a father relationship. The son being Vijay and the father is Mohanlal. Mohanlal is the don in Madurai region. 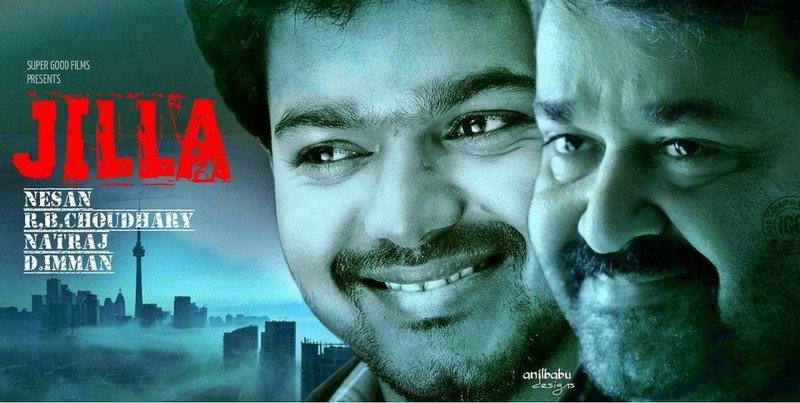 Vijay is the adopted son of Mohanlal. He starts following his father and he is also a local dada. He does not like Khaki dress in any form but he is forced to become the police commissioner. He understands the power of police and goes against his father. Will the son arrest his father or the father kills the son is the rest of the story. Vijay’s acting is good. He had to play a sentimental son, angry youth, local dhadha, police commissioner. He has to show different expressions in different part of the movie. He has played his part well. He is always a crowd puller with his smile and eye expressions. He has done the same in this movie. It is cute too. I have not seen many movies of Mohanlal. Man he is very good in action, even his cheeks are acting. After a long time Poornima Bhagiyaraj has come back to silver screen as the mother. Kajal Agarwal is the heroine of the movie but Poornima Bhagiyaraj had more dialogues than Kajal. Mahat plays the brother in the movie. He has shown the hot and cold side of himself. You need to see the movie to understand what i actually mean. My son could not stop laughing even after the movie. Naveena Saraswathi Sabatam heroine Niveda Thomas (Kathuirunthai anbae yenthan kaadal nee thane) is the sister for Vijay. She is so beautiful and has an expressive face. I really don’t know why she could not make it big in the tamil movie industry. There are 2 more side artists that i should mention who get the audience attention. The first is the boy who has acted as Junior Vijay. He is good looking and has acted very well. Next is one Swarnakka who dances beside Vijay in ஆமாங்கோ song. They both make their presence felt in the scene. There are lot more actors in the movie like Black Pandy, Vidyulla, Thambi Ramiah, Soori etc. I feel they have not been used properly in the movie. May be their scenes are cut due to the length of the movie.